2019 is upon us and in this form we will be comparing the full size pick up truck from the six major brands on the market which are Chevrolet, Ford, Dodge, GMC, Nissan, and Toyota. The big two American brands Chevrolet, and Dodge are offering their new designed trucks for 2019, while Ford updated their pick up truck in 2018. The big two Japanese pick up truck makers Nissan and Toyota are scheduled soon to unveil their updated trucks as well. As I stated earlier Chevrolet is scheduled to unveil their 2019 Chevy Silverado to arrive at your local dealer in the fall of 2019. GMC is also scheduled to reveal the new redesigned full size Sierra pick up in the fall of 2019 as well. The 2019 Chevy Silverado new features include a longer, lighter pickup, weight savings of around 450 pounds, taller driving position and more room in crew-cab models. It also has the largest cargo box in its class and a power-lowering and -raising tailgate that’s exclusive to the class. 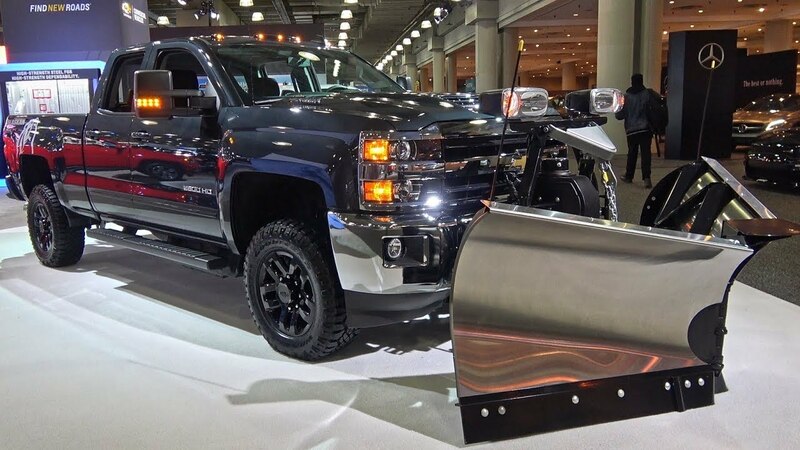 The Silverado offers several engine packages starting with a V6 with (285 horsepower), a V8 with (355 horsepower), a larger and stronger V8 boasting (420 horsepower), a turbocharged four-cylinder putting out (310 horsepower), and a six-cylinder diesel that arrives in early 2019. The 2019 GMC Sierra will offer a more upgraded interior than the Chevy, along with other exclusive features such as a carbon-fiber cargo box and enhanced technology because GMC is an exclusive Truck, and SUV maker for the General Motors brand. The new 2019 Dodge Ram full size pick up is available at your local dealership as we speak. The Ram boast A new frame and body design that will yield more room for rear passengers and reduce the pickup’s overall weight by about 200 pounds, less than the 2018 model. The Ram’s V8 engine is putting out (395 horsepower), and Dodge have paired it with an updated eight-speed transmission that makes more timely shifts. There’s also a 3.6-liter V6 base engine that will be paired up with an electric-assist system for smoother power and acceleration and a maximum tow capacity of 12,750 pounds. 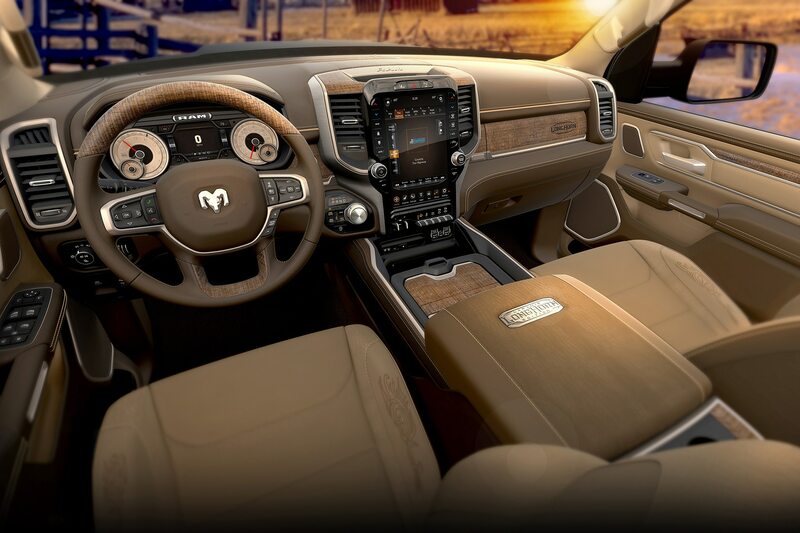 Redesigned front seats, new technology features and an optional 12-inch infotainment display is offered in the new Dodge Ram that will spring Dodge back in the conversation of top full size pickup truck for 2019. Now lets take a look at “That’s A Good Look” Full Size Pickup line up for 2019. Engines: 4.3L V-6 / 6-speed auto, 5.3L V-8 / 6-speed auto, 2.7L Turbo / 8-speed auto, 5.3L V-8 / 8-speed. auto, 6.2L V-8 / 10-speed auto, 3.0L I-6 turbo-diesel / 10-speed auto. Hydra-Matic 10-speed automatic (6.2L, 3.0L turbo-diesel). CHASSIS & SUSPENSION: Front Suspension Independent coil-over-shock with twin-tube shock absorbers; Rancho monotube shocks with Z71 pkg. Two-speed transfer case or Autrotrac automatic transfer case with 4WD, depending on the model. Rear Suspension: Solid axle with semi-elliptic, variable-rate, two-stage multileaf springs (includes composite second-stage springs on LT models), splayed twin-tube shock absorbers; Rancho monotube shocks with Z71 pkg. Two-speed transfer case or Autrotrac automatic transfer case with 4WD, depending on the model. Steering Type: Electric power-assisted rack-and-pinion. Brake Type: Four-wheel disc with electro-hydraulic power assist and ABS; vented front and rear DuralifeTM rotors. Brake Rotor Size (in / mm): 13.5 / 345 (front), 14.1 / 360 (rear). Wheel Size: 17-in. x 8-in. steel (std. ), 17-in. x 8-in. aluminum (avail. ), 18-in. x 8.5-in. aluminum (avail. ), 20-in. x 9-in. aluminum, (avail. ), 22-in. x 9-in. aluminum (avail. on High Country). Tire Size: P255/70R17 all-season, P265/70R17 all-season, LT265/70R17 all-terrain, P265/65R18 all-season or all terrain, LT275/65R18 Goodyear Wrangler DuraTrac, P275/60R20 all-season or all terrain, P275/50R22 all-season. 147.5 / 3747 (Trail Boss) Crew Cab: 147.4/3745 (5’ 8” box), 147.5/3746 (5’ 8” box Trail Boss), 157/3987 (6’ 6” box), 157.1/3989 (6’ 6” box Trail Boss). (5’ 8” box), 241.2/6128 (6’ 6” box). Overall Width (in./mm): Regular Cab: 81.2/2063, Double Cab: 81.2/2063, Crew Cab: 81.2/2063. (6’ 6” box Trail Boss). INTERIOR DIMENSIONS: Headroom (in./mm): Regular Cab: 43.1/1095, Double Cab: 43/1093 (front), 39.9/1013 (rear), Crew Cab: 43/1093 (front) 40.1/1019 (rear). Legroom (in./mm): Regular Cab: 44.5/1131, Double Cab: 44.5/1131 (front), 35.2/895 (rear), Crew Cab: 44.5/1131 (front), 43.4/1102 (rear). Shoulder Room (in./mm): Regular Cab: 66.1/1678, Double Cab: 66/1677 (front), 64.9/1648 (rear), Crew Cab: 66/1677 (front), 65.2/1655 (rear). Hip Room (in./mm): Regular Cab: 61.2/1554, Double Cab: 61.2/1554 (front) 60.2 /1530 (rear), Crew Cab: 61.2/1554 (front) 60.2/1530 (rear). Double Cab: 11600/5261 (2WD), 12200/5534 (4WD), Crew Cab: 11600/5261 (2WD), 12200/5534 (4WD). The MSRP for a 2019 Silverado crew cab ranges from $34,600 to $53,000. ENGINES: 5.3L V-8 VVT DI with Dynamic Fuel Management and Stop/Start, 6.2L V-8 VVT DI with Dynamic Fuel Management and Stop/Start. TRANSMISSION: 8-speed automatic mated to (5.3L) engine, 10-speed automatic mated to (6.2L) engine. FUEL TANK CAPACITY: 24 gal./91 liters. GM-EST. FUEL ECONOMY: 5.3L V-8 / 8-speed auto. City 17 (2WD), 15 (4WD), Highway 23 (2WD) 21 (4WD), 6.2L V-8 / 10-speed auto. City 15 (4WD), Highway 20 (4WD). 75.5/1918 (4WD – 5’ 8” box), 75.4/1914 (2WD – 6’ 6” box), 75.4/1915 (4WD – 6’ 6” box). The MultiPro Tailgate also incorporates a step entry and egress mode that, when paired with the assist handle, offers both step and seated functionality, with a maximum weight capacity of 375 pounds (170 kg). Ease of use is enhanced with two buttons on the tailgate handle that allow convenient inner gate release. 2020/916 (4WD), Max Trailering (lb./kg): 9600/4354 (2WD), 9400/4264 (4WD). 6.2L Engine Base Curb Weight (lb./kg): 5443/ 2469 (4WD), Max GVWR (lb./kg): 7100/3220 (4WD), Max Payload (lb./kg): 1610/730 (4WD), Max Trailering (lb./kg): 9300/4218 (4WD). 1970/893 (4WD), Max Trailering (lb./kg): 9600/4354 (2WD), 9400/4264 (4WD). 6.2L Engine Base Curb Weight (lb./kg): 5516/ 2502 (4WD), Max GVWR (lb./kg): 7100/3220 (4WD), Max Payload (lb./kg): 1540/698 (4WD), Max Trailering (lb./kg): 9100/4127 (4WD). The 2019 Sierra offers a more confident towing experience thanks to GMC’s new ProGrade Trailering System, standard on Denali and SLT. The trailering system includes an all-new Trailering App featuring a Pre-Departure checklist, Maintenance Reminders, Trailer Light Test, Trailer Electrical Diagnostics and Trailer Tire Pressure and Temperature Monitoring. Many of the Trailering App’s functions, including the lighting test and pre-departure checklist, are also available with the MyGMC app on compatible Android and iOS smartphones, a feature that offers great convenience when outside the truck or trailer. The next generation Sierra also offers Hitch Guidance with Hitch View and Auto Electric Park Brake to help with perfect positioning when hitching. The available side view cameras and a trailer-mounted HD camera provide additional assistance when driving down the road or in reverse. With exclusive Trailer Theft Detection, owners can receive text and mobile alerts from OnStar when the trailer has been detached from the truck without permission. 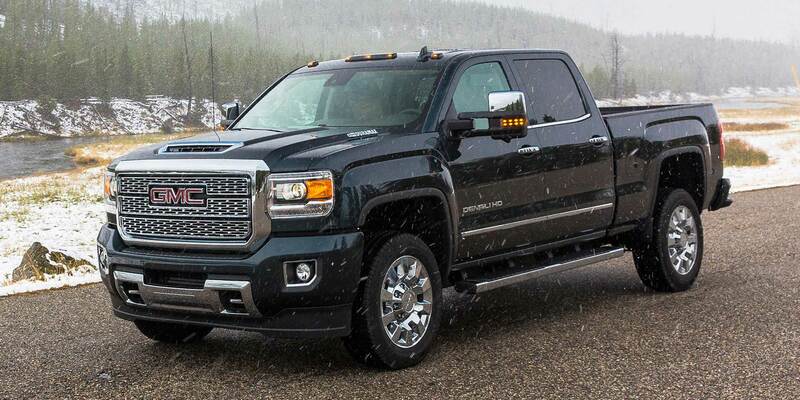 The MSRP for a 2019 GMC Sierra 1500 Regular Cab starting at $29,600, Double Cab starting at $33,500, Crew Cab starting at $35,900. 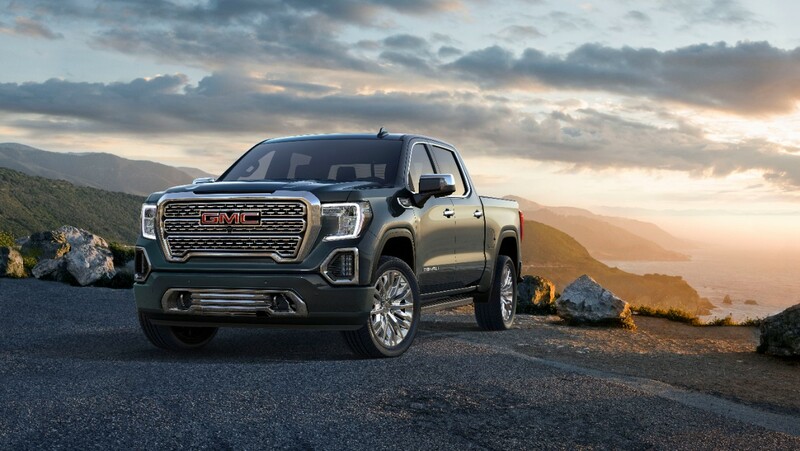 The MSRP for 2019 GMC Sierra 1500 Denali 5.3L V8 Short Box Crew Cab starting at $54,700, Denali 5.3L V8 Long Box Crew Cab starting at $55,000, Denali 5.3L V8 4WD Short Box Crew Cab starting at $58,000. The MSRP for a 2019 GMC Sierra 2500HD Denali starting at $56,600, Denali 6.0L V8 4WD Crew Cab starting at $59,800, Denali 6.6L V8 Diesel Crew Cab starting at $66,540, Denali 6.6L V8 Diesel 4WD Crew Cab starting at $69,740. The MSRP for a 2019 GMC Sierra 3500HD Denali starting at $56,600, Denali 6.0L V8 Short Box Crew Cab Starting at $56,600, Denali 6.0L V8 Long Box Crew Cab starting at $56,600, Denali 6.0L V8 4WD Long Box Crew Cab starting at $59,500. The 2019 F-150 is available in six different styles: XL, XLT, Lariat, King Ranch, Platinum and the Limited. The F-150 is also sold as an off-road performance model called the Raptor. 2019 F-150 come in three cab configurations: Regular, SuperCab and SuperCrew. ENGINES: Standard 3.3-liter V6 engine, 2.7-liter EcoBoost V6, 3.5-liter EcoBoost V6, 5.0-liter V8, 3.0-liter diesel V6 , high-output 3.5-liter EcoBoost V6. TRANSMISSIONS: six-speed automatic transmission is standard, and a 10-speed automatic transmission is available. FUEL TANK CAPACITY: 23 to 36 gallons. FUEL ECONOMY: Up to 20 miles per gallon city/26 miles per gallon on the highway. EXTERIOR/INTERIOR DIMENSIONS: The 2019 F-150 has a wheelbase that ranges from 122.4 inches to 163.7 inches depending on cab and bed configuration. The overall length ranges from 209.3 inches to 250.5 inches. 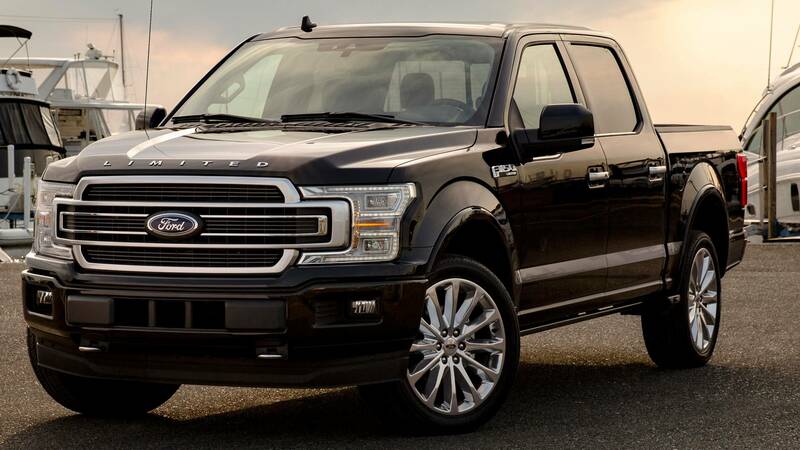 The F-150 is 79.9 inches wide in all configurations. The Bed Length is from 78.9 to 97.6 in. The Ground Clearance is from 8.6 to 8.8 in, and the wheel size is 17 in. Cargo Capacity is 6.45 ft. Cargo Area Length 6.58 to 8.13 ft, and Cargo Area Height is 1.78 ft.
CURB WEIGHT, CAPACITIES & TRAILERING: The available second-generation 3.5L EcoBoost twin-turbo V6, at 375 horsepower and top-rated 470 lb.-ft. of torque, has the conventional tow rating of 13,200 lbs. 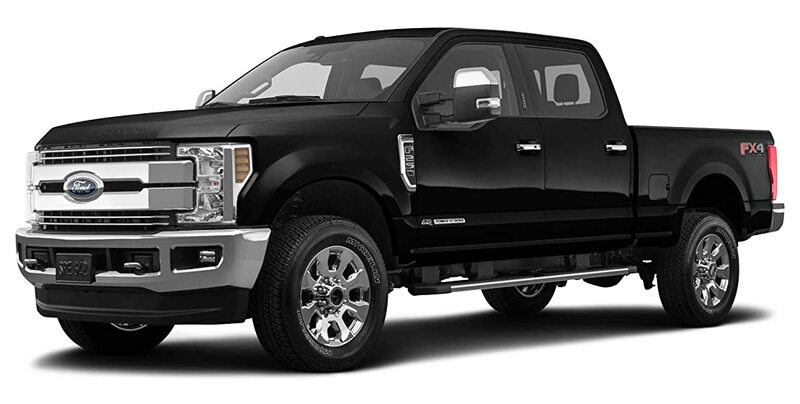 The 3.0L Power Stroke Turbo Diesel, rated at 250 horsepower and 440 lb.-ft. of torque, has a tow rating at 11,400 lbs. Class is Full-Size Pickups under 8,500 lbs. GVWR based on Ford segmentation. Max towing on F-150 XL SuperCrew, 6.5′ box, 3.5L EcoBoost 4×2 and Max Trailer Tow Package. Max towing on F-150 LARIAT SuperCab or SuperCrew, 6.5’ box, 3.0L Power Stroke Diesel 4×2, Trailer Tow Package and 3.55 rear axle. Class is Full-Size Pickups under 8,500 lbs. GVWR based on Ford segmentation. Reducing weight is an effective way to increase payload, and that’s a huge benefit of the F-150 body and bed built of lightweight and high-strength, military-grade aluminum alloy. What results is a payload rating in F-150 models powered by Ford 5.0L V8. The 5.0L features the Ford port-fuel and direct-injection (PFDI) system with two injectors per cylinder — one in the air intake port, another inside the cylinder — to improve power and efficiency. Impressive power ratings are 395 horsepower and 400 lb.-ft. of torque. Max payload on F-150 XL Regular Cab, 8′ box, 5.0L V8 4×2, Heavy-Duty Payload Package and 18″ heavy-duty wheels. Class is Full-Size Pickups under 8,500 lbs. GVWR based on Ford segmentation. F-150 provides trailer sway control as a feature of the AdvanceTrac, with RSC (Roll Stability Control) system. Standard as well as is a smart trailer tow connector that alerts to connectivity issues, lighting and battery problems, and you have these available features that make the task of towing easier: Pro Trailer Backup Assist — synchronize truck and trailer while backing up, Dynamic hitch assist with line-of-sight guide — direct the hitch to the trailer receiver, 8″ productivity screen — trailer information, Factory-installed trailer brake controller — synchronize truck and trailer brakes, BLIS (Blind Spot Information System) with trailer coverage — alerts when a vehicle is in your blind spot or alongside the trailer. The MSRP for a 2019 Ford F150: 7 Models to select from $28,155 – $67,135. 2019 F-150 XL starting at $28,155, 2019 F-150 XLT starting at $34,160, 2019 F-150 Lariat starting at $41,700, 2019 F-150 King Ranch starting at $52,390, 2019 F-150 Platinum starting at $54,920, 2019 F-150 Limited starting at $67,135, and the 2019 F-150 Raptor starting at $52,855. The Dodge Ram 1500 is available in six different styles. The Dodge Ram 1500 Limited, Laramie Longhorn, Laramie, Rebel, Big Horn/Lone Star, and the Tradesman. 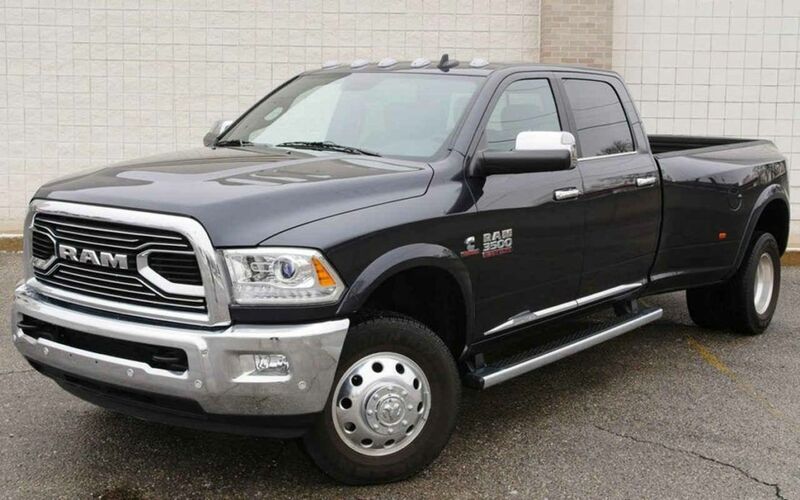 The Ram is available in a Regular Cab, and a Crew Cab. ENGINES: 2019 Ram 1500 delivers significant gains in fuel efficiency with eTorque mild hybrid system on second generation 3.6-liter Pentastar V-6 and legendary 5.7-liter HEMI® V-8 engines – widest use of mild hybrid technology. The eTorque combines belt-drive motor generator unit with 48-volt battery pack to enable start/stop function, short-term torque assist and brake energy regeneration. The eTorque adds up to 90 lb.-ft. of torque to the 3.6-liter Pentastar V-6 and up to 130 lb.-ft. to the 5.7-liter HEMI V-8. Frame-mounted active tuned mass modules (ATMM) and Active Noise Cancellation in cabin expand use of Fuel Saving Technology cylinder cutoff on 5.7-liter HEMI V-8 and enable quiet cabin at 67.1 db. New generation of TorqueFlite eight-speed automatic transmissions provide improved efficiency with more powerful control computers. New electronic locking rear differential is standard on 4×4 Off-road Package and Rebel, available on all models. Heat exchanger system now includes industry-first thermal axle to quickly warm rear axle gear oil, maximizing axle during warm-up. TRANSMISSIONS: Every 2019 Ram 1500 is equipped with a fully electronic TorqueFlite eight-speed automatic transmission with a wide spread of gear ratios that keeps engine rpm in the right range for the task. Trucks equipped with the 3.6-liter Pentastar V-6 use a TorqueFlite 850RE transmission. The 5.7-liter HEMI V-8 uses an upgraded TorqueFlite 8HP75 transmission. Both transmissions use a new generation of computer controllers that process data faster and coordinate transmission operation with the eTorque mild hybrid system. There are more than 40 individual shift maps to optimize shift changes and points for fuel economy, performance and drivability. FUEL TANK CAPACITY: 23 to 26 gallons. FUEL ECONOMY: Up to 20 miles per gallon city/25 miles per gallon on the highway. 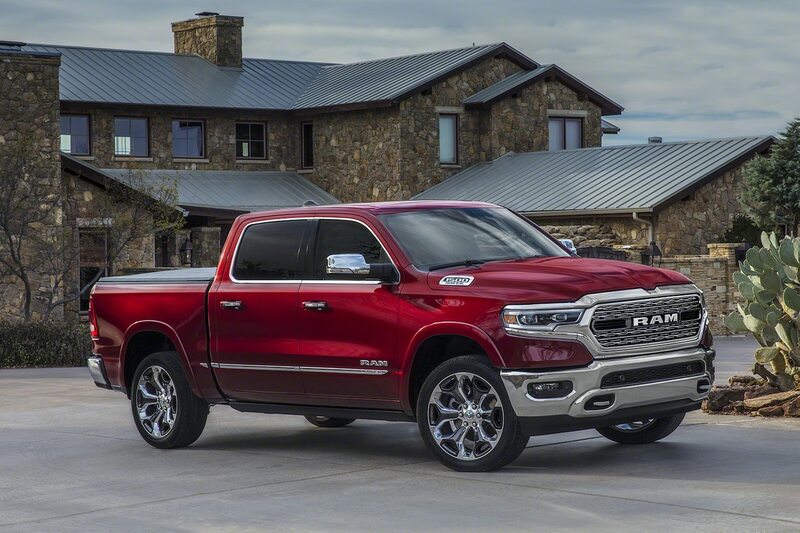 EXTERIOR/INTERIOR DIMENSIONS: The 2019 Dodge Ram Exterior Dimensions are Height, Overall (in)77.6, Length, Overall w/o rear bumper (in)232.9, Ground Clearance, Front (in)NA, Width, Max w/o mirrors (in)82.1, and Wheelbase (in)144.5. The Cargo Area Dimensions are Cargo Box Width @ Wheelhousings (in)51, Cargo Box Width @ Top, Rear (in)66.4, Cargo Volume (ft³) 53.9, Cargo Box (Area) Height (in)21.4, Cargo Box Width @ Floor (in)66.4, Cargo Box Length @ Floor (in)67.4, and Tailgate Width (in)60. Interior Dimensions Front Shoulder Room (in)66, Second Hip Room (in)63.4, Front Head Room (in)40.9, Second Leg Room (in)45.2, Front Hip Room (in)63.4, Front Leg Room (in)40.9, Second Shoulder Room (in)65.7, Passenger Capacity 6, and Second Head Room (in)39.8. CURB WEIGHT, CAPACITIES & TRAILERING: The 2019 Dodge Ram 1500 weight information Gross Axle Wt Rating – Front : lbs 3900, Gross Axle Wt Rating – Rear : lbs 4100, Curb Weight – Front : lbs 2901, Curb Weight – Rear : lbs 2088, Reserve Axle Capacity – Front : lbs 999.00, Reserve Axle Capacity – Rear : lbs 2012.00, As Spec’d Curb Weight : lbs 4989.00, As Spec’d Payload : lbs 1811.00, Maximum Payload Capacity : lbs 1811.00, Gross Combined Wt Rating : lbs 11900, Gross Axle Weight Rating : lbs 8000.00, Curb Weight : lbs 4989.00, Reserve Axle Capacity : lbs 3011.00, Gross Vehicle Weight Rating : lbs 6800.00. The max pay load for the 2019 Dodge Ram 1500 range from 1690-1720, and it’s max towing capacity is 10,620. Dodge Ram max towing capacity 12,750 pounds. Highest 5th wheel towing capacity – 30,000 lbs. with Ram 3500 Cummins Turbo Diesel. Sixteen new wheel designs align with an increased lug pattern —from five to six —and are available from 18-inches to an impressive 22-inches in diameter. The all-new Ram 1500 features the largest available front brakes at 14.9 inches for superb stopping distance. 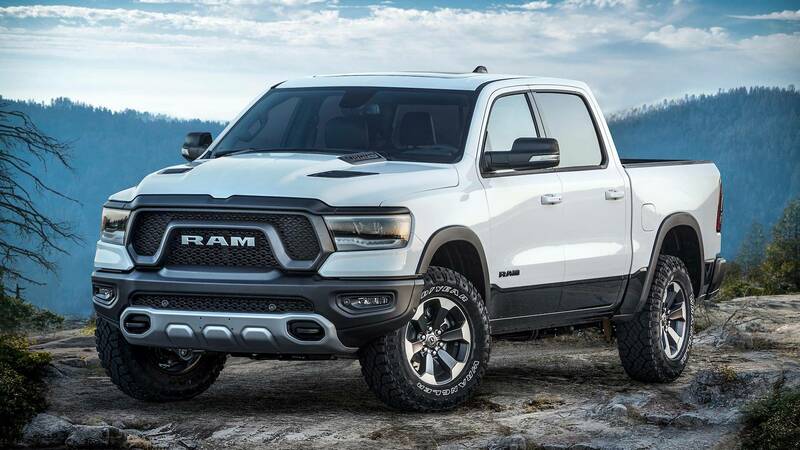 The MSRP for a 2019 Dodge Ram 1500 Regular Cab starting at $31,795, 1500 Limited 4X4 5’7″ Box price starting $56,795, The Dodge Ram Rebel Regular Cab starting at $31,795, the Rebel Quad Cab 4×4 with 6’4″ Box price starting at $44,795, The Dodge Ram 1500 Big Horn/Lone Star Regular Cab starting at $31,795, The Dodge Ram Big Horn/Lone Star Crew Cab 4×4 with 5’7″ Box starting at $42,295, The Dodge Ram 1500 Laramie Longhorn Quad Cab starting at $50,595, The Dodge Ram 1500 Laramie Quad Cab starting at $42,595, and the Dodge Ram 1500 Tradesman Quad Cab starting at $34,595. The 2019 Nissan Titan is 2019 is available in a full range of half-ton designs, including Single Cab, King Cab and Crew Cab body configurations, 4×2 and 4×4 drive, and a choice of up to five grade levels. TITAN Crew Cab is available in five well-equipped trim levels – S, SV, PRO-4X, SL and Platinum Reserve. All are offered with 4×2 or 4×4 drive configurations, except for the PRO-4X model, which is available exclusively as a 4×4. TITAN King Cab is available in S, SV (4×2, 4×4) and PRO-4X (4×4) grades, while TITAN Single Cab is offered in S and SV 4×2 and 4×4 models. TITAN Midnight Edition Package, first introduced in 2018, is again available on Crew Cab SV and SL grade 4×4 and 4×2 models. The TITAN Midnight Edition Package includes a body color front grille with dark insert, dark headlamps, black fog lamp finisher, black exterior badging, black mirrors, black door handles, 20-inch black wheels, body color front and rear bumpers, black step rails, charcoal interior trim and “Midnight Edition” exterior badge. ENGINE: All 2019 Nissan Titan pickup’s are equipped with the advanced 5.6-liter Endurance V8 engine, rated at 390 horsepower @ 5,800 rpm and 394 lb-ft of torque. The engine utilizes Nissan’s VVEL (Variable Valve Event & Lift) technology, which combines hydraulic-controlled variable valve timing and electronically controlled variable valve lift on the intake side to provide high performance and crisp response. Throttle response is enhanced by directly controlling the intake valve, rather than using the traditional method of controlling intake with a throttle valve, and valve timing and opening with non-variable camshafts. 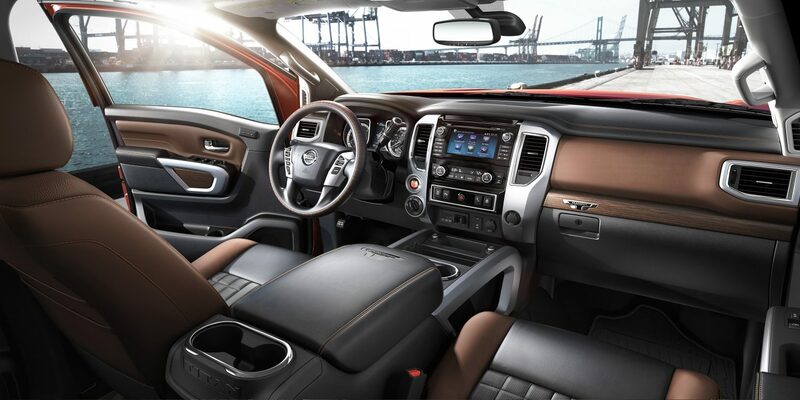 TRANSMISSION: The 2019 Nissan Titan is a heavy duty 7-speed automatic transmission tuned exclusively for Titan. FUEL TANK CAPACITY: The 2019 Nissan Titan fuel tank have a capacity of 26 gallons. FUEL ECONOMY: The 2019 Nissan Titan miles per gallon is up to 15 miles per gallon city/21 miles per gallon highway. 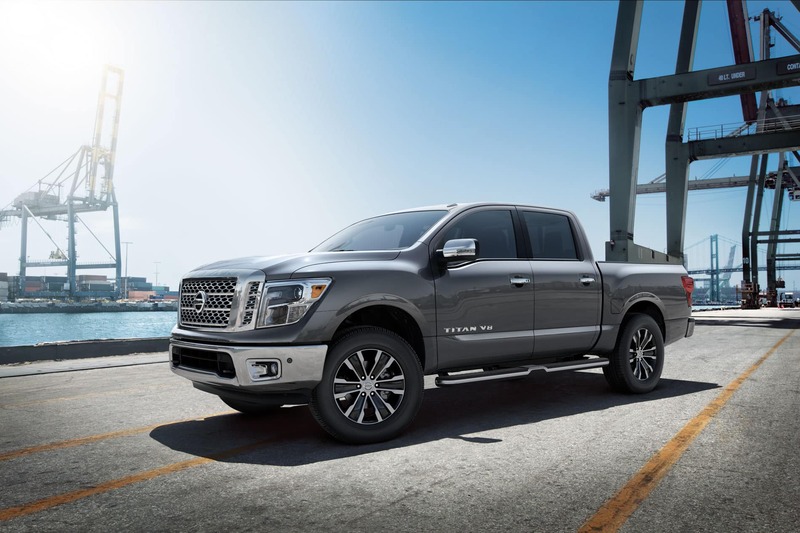 EXTERIOR/INTERIOR DIMENSIONS: The 2019 Nissan Titan exterior dimensions are the wheelbase is 139.8″, Overall length range from 228.1″ to 228.5″, Overall width from 79.5″ to 80.7″, Overall height range from 75.4″ to 77.2″, Angle of approach (degrees) range from 16.4″ to 22.8″, Angle of departure (degrees) range from 20.8″ to 23.0″, Breakover angle (degrees) range from 18.7″ to 21.7″, Bed length 67.0″, Minimum ground clearance front range from 8.3″ to 10.6″, Rear axle range from 9.6″ to 9.8″, Step-in height front range from 21.4″ to 23.2″, rear range from 23.3″ to 25.1″. Interior Front row headroom 41.0″, Shoulder room 63.3″, Hip room 60.8″, Knee room 26.6″, Leg room 41.8″. Second row headroom 40.4″, Shoulder room 63.6″, Hip room 60.3″, Knee room 23.9″, Leg room 38.5″. Total interior volume is 119.7″. 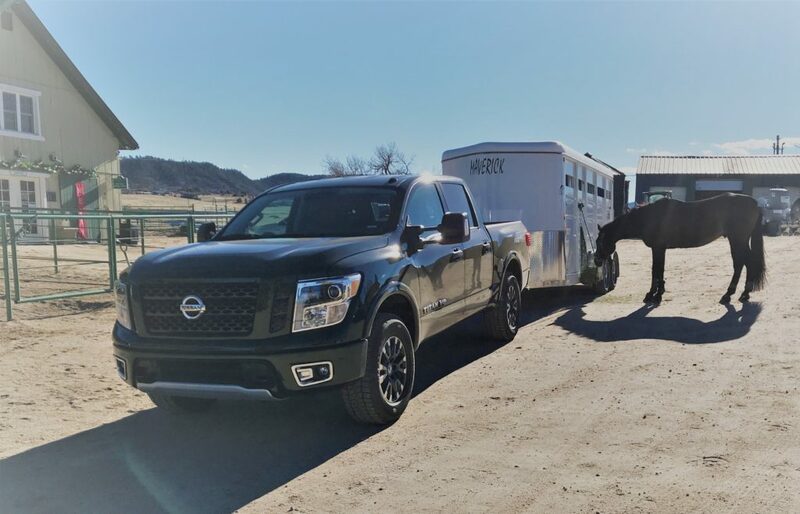 CURB WEIGHT, CAPACITIES & TRAILERING: The 2019 Nissan Titan Curb weight (pounds) range from 5,535 lbs to 5,927 lbs, Wt. Dist. (f/r) range from 56/44 lbs – 57/43 lbs to 58/42 lbs, GVWR (pounds) range from 7,100 lbs to 7,300 lbs, Maximum payload range from 1,310 lbs to 1,620 lbs. 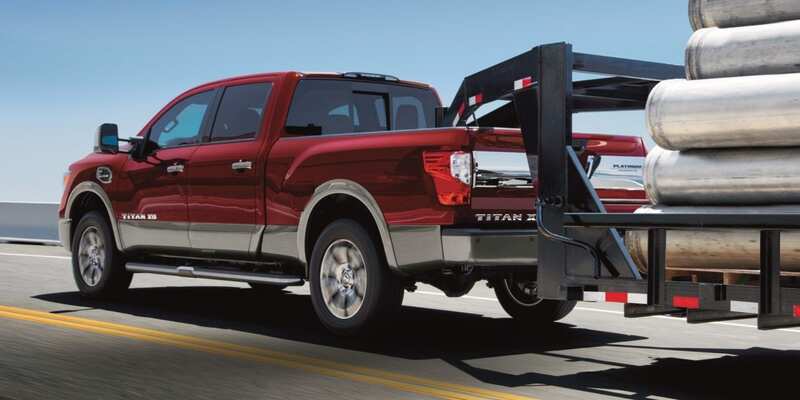 The Titan offers cutting-edge available towing, utility features and driving aids, including an Integrated Trailer Brake Controller, Trailer Sway Control (TSC), Tow/Haul Mode with Downhill Speed Control and a Trailer Light Check system that allows one-person hook-up operation – including checking turn signals, brake lights and running/clearance lights. It offers an available maximum towing capacity of 9,660 pounds and maximum payload capacity of 1,860 pounds when properly equipped. Also assisting trailer hook-ups is the RearView Monitor with Trailer Guides, and Intelligent Around View® Monitor (I-AVM) with Moving Object Detection (MOD). TITAN also includes a range of other available advanced driving aids, including Blind Spot Warning (BSW), Front and Rear Sonar System and Tire Pressure Monitoring System (TPMS). The 2019 TITAN rides on 18-inch steel or aluminum-alloy wheels or 20-inch aluminum-alloy wheels with 265/75R18, 265/70R18, 275/60R20 all-season or 275/70R18 all-terrain tires. Black-painted 20-inch aluminum-alloy wheels are offered with the Midnight Edition Package. Braking is provided by a 4-wheel disc system with 13.78 x 1.2-inch front/13.58 x 0.8-inch rear ventilated discs front and rear with hydraulic power assist. The high brake fluid pressure generated by an electric pump assists brake pedal force for a confident feel. Responsive steering is provided by a rack-and-pinion steering system. The MSRP for the 2019 Titan Single Cab range from $30,390 to $37,370, The Titan King Cab range from $33,640 to $44,780, The Titan Crew Cab range from $36,580 to $57,740. cab styles can be folded up for additional cargo carrying. All Tundra beds are 22.2 inches deep and, when properly equipped, offer a payload capacity of up to 1,730 pounds. The lockable easy-lower-and-lift tailgate lowers slowly with no slam and can easily be removed. Carrying larger items is a cinch with the available deck rail system and a spray-in bed liner. ENGINES: The 2019 Toyota Tundra offer two different V8 engines. The standard 4.6-liter i-Force V8 produces 310 horsepower at 5,600 rpm and 327 lb.- ft. of peak torque at 3,400 rpm. The 5.7-liter creates 381 horsepower at 5,600 rpm and 401 lb.-ft. of peak torque at 3,600 rpm. Both i-Force V8s utilize an aluminum cylinder block, double overhead-cam heads with four valves per cylinder, Dual Independent Variable Valve Timing with intelligence (VVT-i), and an Acoustic Control Induction System for a broad torque curve. TRANSMISSION: All 2019 Toyota Tundra models are equipped with a 6-speed electronically controlled automatic transmission. FUEL TANK CAPACITY: The 2019 Toyota Tundra fuel tank capacity range from 26.4 to 38 gallons. FUEL ECONOMY: The 2019 Toyota Tundra miles per gallon is up to 15 miles per gallon city/19 miles per gallon highway. 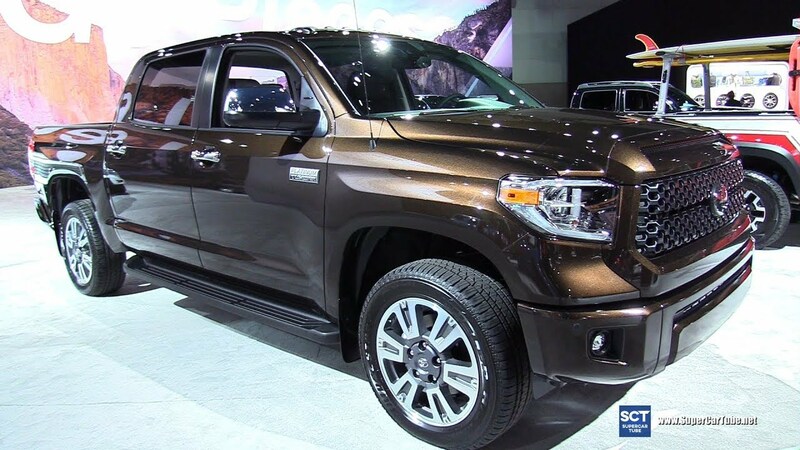 EXTERIOR/INTERIOR DIMENSIONS: The 2019 Toyota Tundra exterior dimensions starting with Overall height range from 75.8″ to 76.0″, Overall width 79.9″, Overall length 228.9″, Wheelbase 145.7″, Track (front/rear) 67.9″/67.9″, Bed length range from 66.6″ to 78.7″, Bed depth 22.2″, Bed width (total/between wheel-wells) 66.4″/50.0″. 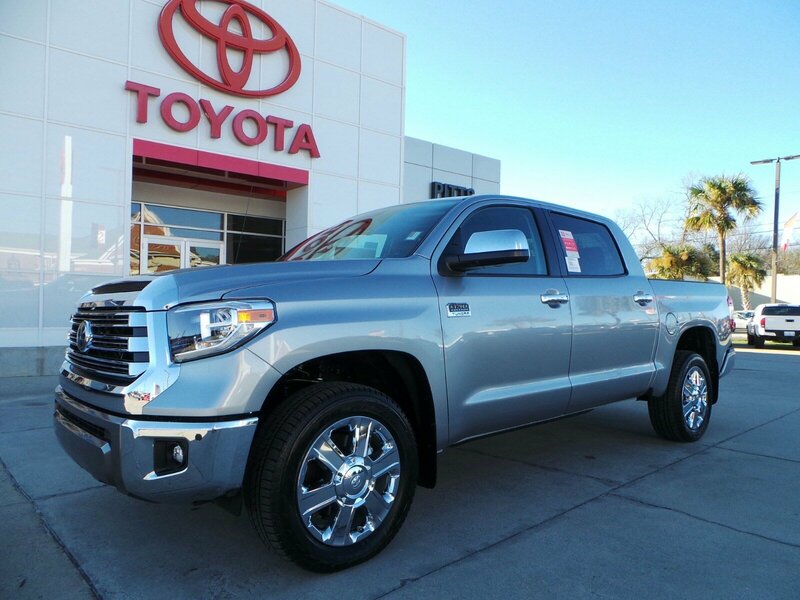 The interior dimensions in the 2019 Toyota Tundra front/rear Head room is 39.7″/38.7″, Hip room range from 62.6″/60.4″ to 62.6″/62.6″, Leg room range from 42.5″/34.7″ to 42.5″ to 42.3″, and Shoulder room 65.7″/65.6″. integrating it into the frame. The 5.7-liter’s Tow Package upgrades Tundra’s cooling and electrical systems as well. Integrated engine and transmission oil coolers, in conjunction with an added heavy-duty battery and alternator. The Tow Package’s selectable TOW/HAUL mode adjusts throttle sensitivity and transmission shift control, favoring and holding lower gears when accelerating or decelerating to help enhance control and safety. A function of Vehicle Stability Control, Trailer Sway Control facilitates safe towing by counteracting handling forces that can cause trailer sway. The Tundra also comes with an integrated Trailer Brake Controller, and the driver can view its status on the multi-information display screen. All Tundra models come standard with a backup camera (viewed from the Entune Audio display screen or available navigation screen). On select 5.7-liter models, heated and power outside tow mirrors with turn signal indicators and manualextend feature are available. Tundra SR and SR5 grades ride on 18-inch styled steel wheels, the TRD Pro rides on 18-inch forged aluminum BBS wheels, while the Limited, Platinum and 1794 Edition feature 20-inch alloy wheels. 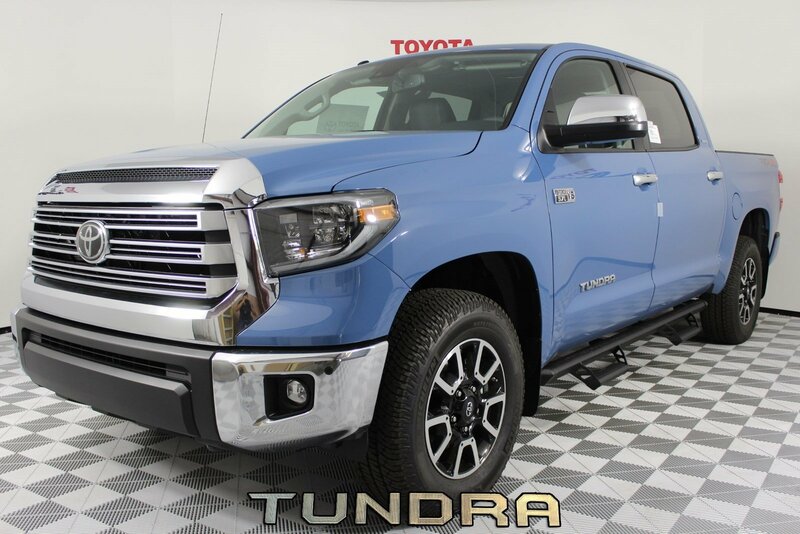 The MSRP for the 2019 Toyota Tundra SR Model 4×2 Double Cab 4.6L V8 6.5-Ft. Bed starts at $31,420, SR5 Model 4×2 Double Cab 4.6L V8 6.5-Ft. Bed starts at $33,220, Limited Model 4×2 Double Cab 5.7L V8 6.5-Ft. Bed starts at $40,685, Platinum Model 4×2 CrewMax 5.7L V8 5.5-Ft. Bed starts at $47,380, 1794 Edition Model 4×2 CrewMax 5.7L V8 5.5-Ft. Bed starts at $47,380, TRD PRO Model 4×4 CrewMax TRD Pro 5.7L V8 5.5-Ft. Bed starts at $49,645.